The Incoterms rules or International Commercial Terms are a series of pre-defined commercial terms published by the International Chamber of Commerce (ICC). They are widely used in International commercial transactions or procurement processes. A series of three-letter trade terms related to common contractual sales practices, the Incoterms rules are intended primarily to clearly communicate the tasks, costs, and risks associated with the transportation and delivery of goods. 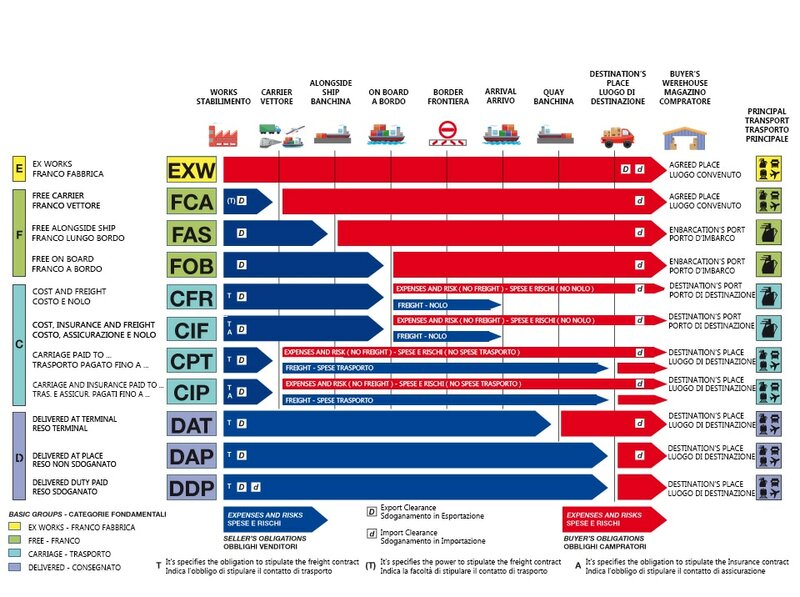 The Incoterms rules are accepted by governments, legal authorities, and practitioners worldwide for the interpretation of most commonly used terms in international trade. They are intended to reduce or remove altogether uncertainties arising from different interpretation of the rules in different countries. As such they are regularly incorporated into sales contracts worldwide. The seller delivers when the goods are placed alongside the buyer's vessel at the named port of shipment. This means that the buyer has to bear all costs and risks of loss of or damage to the goods from that moment. The FAS term requires the seller to clear the goods for export, which is a reversal from previous Incoterms versions that required the buyer to arrange for export clearance. However, if the parties wish the buyer to clear the goods for export, this should be made clear by adding explicit wording to this effect in the contract of sale. This term should be used only for non-containerized sea-freight and inland waterway transport. Under FOB terms the seller bears all costs and risks up to the point the goods are loaded on board the vessel. The seller's responsibility does not end at that point unless the goods are "appropriated to the contract" that is, they are "clearly set aside or otherwise identified as the contract goods. Therefore, FOB contract requires a seller to deliver goods on board a vessel that is to be designated by the buyer in a manner customary at the particular port. In this case, the seller must also arrange for export clearance. On the other hand, the buyer pays cost of marine freight transportation, bill of lading fees, insurance, unloading and transportation cost from the arrival port to destination. Since Incoterms 1980 introduced the FCA incoterm, FOB should only be used for non-containerized seafreight and inland waterway transport. However, FOB is commonly used incorrectly for all modes of transport despite the contractual risks that this can introduce. In common law countries, FOB is not only connected with the carriage of goods by sea but also used for inland carriage aboard any "vessel, car or other vehicle. This term is broadly similar to the above CFR term, with the exception that the seller is required to obtain insurance for the goods while in transit to the named port of destination.The seller must also turn over documents necessary, to obtain the goods from the carrier or to assert claim against an insurer to the buyer. The documents include (as a minimum) the invoice, the insurance policy, and the bill of lading. These three documents represent the cost, insurance, and freight of CIF. The seller's obligation ends when the documents are handed over to the buyer. Then, the buyer has to pay at the agreed price. Another point to consider is that CIF should only be used for non-containerized seafreight; for all other modes of transport it should be replaced with CIP.